'Mass E Bhat' is a feature length documentary produced by The Rainbow Collective with the support of Channel 4 Britdoc Foundation, Openvizor and CBA DFID (Worldview). Hard-hitting and unforgettable, Mass-e-Bhat explores the unseen impact of capitalism's invisible hand. Framed around the inspiring life of Nasir, a child labourer turned social worker from Bangladesh, Mass-e-Bhat presents a portrait of the developing world as experienced by it's children. Having worked under abysmal conditions in sweat shop garment factories at the age of 8, Nasir now rescues "working children" by enrolling them in school. Moving stories about the people who live in poverty to produce our clothes are presented alongside Nasir's quest to better his life, and the lives of other child labourers. 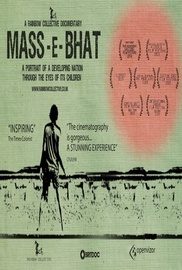 Mass E Bhat was nominated for Best Documentary and Best Soundtrack at the East End Film Festival in London. You can buy Mass E Bhat & AmaZulu in this special bundle. Both documentaries focus on children in South Africa and Bangladesh.